On June 28: John Reischman and the Jaybirds flew into Elko - and more! The Western Folklife Center hosted John Reischman and the Jaybirds on Thursday, June 29 for a 2:00 pm workshop and 7:00 pm concert featuring new tunes and songs from their brand new recording, On that Other Green Shore. There was room for dancing at the concert, and the Pioneer Saloon opened at 5:30 pm for cold beverages. Also at 5:30 pm, the Wiegand Gallery hosted a FREE exhibition reception and illustrated talk by Jean Earl about "Basque Arborglyphs of the Great Basin." Bluegrass Band Rhythm Workshop, 2:00 – 3:30 pm: Pre-registration $10 (please contact Amber at 775/738-7508 to pre-register). Blending instruments and sound into a musical ensemble; ideal for bands, sound designers, DJs and anyone wanting to tighten the mix of their musical performance when working with others. Discount of $15 offered for workshop and concert! This was a special night: we invited everyone to come early at 5:30 pm for a free exhibition reception with Jean Earl for an illustrated tour of the discoveries of Basque Arborglyphs of the Great Basin. Concert at 7:00 pm: Tickets are $20 general admission, $15 for students, seniors, Western Folklife Center members and workshop participants; $5 for children age 12 and under. Advance tickets were available at the Western Folklife Center Gift Shop, 501 Railroad Street, or by calling 775/738-7508. The Jaybirds feature some of the finest acoustic musicians on the road west. 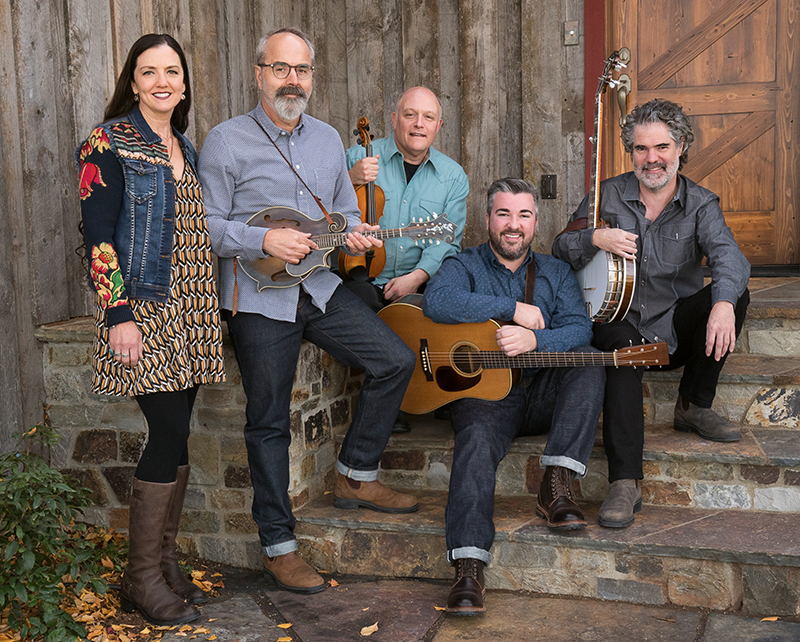 Featured in order of appearance in photo, above, Nick Hornbuckle (banjo, vocals), Patrick Sauber (guitar, vocals), John Reischman (mandolin, vocals), Trisha Gagnon (bass, vocals) and Greg Spatz (fiddle). Like the powerful mandolinist and composer at its helm, John Reischman and the Jaybirds fashion a chic take on bluegrass that seamlessly blends original songs and instrumentals with Appalachian old-time music for a truly unique band sound. Now on their 20th year, with seven acclaimed albums and two Juno nominations, the Jaybirds are simultaneously innovative and unadorned, sophisticated and stripped-down, happily old-fashioned and 21st-Century contemporary. A world-renowned mandolinist and composer, veteran performer John Reischman currently hails from Vancouver, British Columbia. John has also releaased three critically-acclaimed solo instrumental albums and recorded on dozens of other projects, including the GRAMMY-winning True Life Blues: The Songs of Bill Monroe. Called "one of the world's undisputed masters" of the mandolin by Bluegrass Unlimited, John is known for producing wonderful tone from his famous 1924 Gibson "Loyd Loar" F-5 mandolin. Los Angeles-based Patrick Sauber is the newest member on guitar and vocals. Patrick is considered one of the West Coast's most sought-after sidemen. A soaring harmony singer and firecracker lead guitarist, he is featured on the 2016 GRAMMY-nominated album, The Hazel and Alice Sessions, by Laurie Lewis and the Right Hands. Chilliwack, British Columbia-based Trisha Gagnon is portrayed by Sing Out! as "one of the most versatile" and "irresistible" lead vocalists in bluegrass, her strong and distinctive style ranging from "mournful and plaintive" to "hopeful and yearning." Trisha anchors what Dirty Linen Magazine calls "gorgeous three-part harmonies." Her solo album, a story about you and me, includes guests Vince Gill and Peter Rowan. Nick Hornbuckle, based in Nanaimo, British Columbia, has developed his own voice on the five-string banjo - a two-finger roll unlike other contemporary banjo players. Says the L.A. Daily News, "Nick Hornbuckle's banjo can be downright spine-tingling." His solo album 12x2 (+/-1), was nominated for a Canadian Folk Music Award in 2015, and Nick is a composer who also digs for rare old-time gems. Spokane, Washington-based Greg Spatz is hailed as a "world-class bluegrass fiddler" by Fiddler magazine. His Paul Bunyan-esque chops have made him a popular fixture on the West Coast, where he's played with iconic mandolinist Frank Wakefield and resophonic guitar master Rob Ickes. Greg also tours and records with Mighty Squirrel, has a solo album called Fiddler's Dream, and is an award-winning novelist. For more than a half century, Jean and Phillip Earl of Reno used cluse from old maps, letters and books to hunt for and document "Mountain Picassos," distinctive figures carved into aspen trees in the high country meadows in the mountain ranges of the Great Basin. On June 28, Jean Earl took the audience on an illustrated tour of these discoveries, carved by Basque sheepherders in the early to mid-20th Century, featured in the exhibitions, Basque Aspen Art (currently on exhibition in the Wiegand Gallery) and Mountain Picassos, Basque Arborglyphs of the Great Basin, a Nevada Touring Initiative/Traveling Exhibition Program of the Nevada Arts Council. Read more about the current exhibition. Newer PostAnnouncing the Featured Artists of the 35th Gathering!